Alpha Psi Omega is a national theatre honor society that has recognized and rewarded exemplary student participation in theatre productions since 1925. With over 600 casts nationwide, it is the largest national honor society. 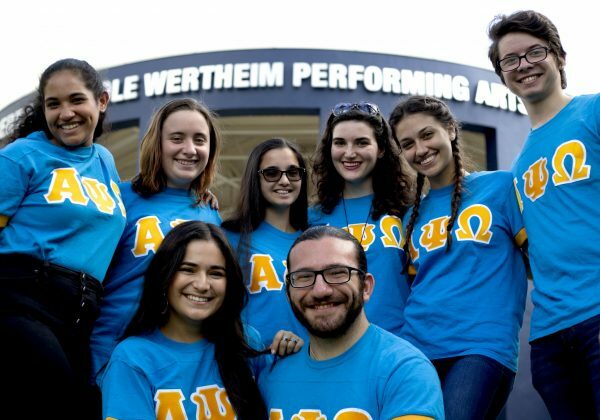 The Alpha Alpha Lambda cast of Alpha Psi Omega was re-established in the Fall semester of 2014 to provide acknowledgement of those students of FIU Theatre demonstrating a high standard of accomplishment in their academic and theatrical endeavors. Members “seek a life useful” by using their talents and the passion they share for theatre to serve their academic and local theatre communities. Broadway Backwards is throwing a twist to the Broadway songs and scenes everyone knows. Performers can perform songs or scenes from the opposite gender! The annual Act Against AIDS Showcase is a charity showcase presented by members of APO and FIU Theatre students every Spring semester. All proceeds are donated to Broadway Cares/Equity Fights AIDS, one of the nation’s leading industry-based, nonprofit AIDS fundraising and grant-making organizations. Using their many talents in theatre, members participate in charity fundraisers, showcases, and community performances to positively impact their local and global communities. FIU Theatre Week allows FIU Theatre students and faculty to celebrate being a part of an increasingly active theatre community that promotes artistic and personal growth. This week helps department veterans remember why they love their department so much and encourages new students to become involved.